If you at all interested in the crisis in mental health in Norfolk and Suffolk, this is an essential recording. 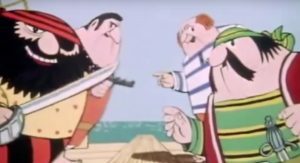 Listen to the Norfolk & Suffolk NHS Foundation Trust (NSFT) executives directly challenged by service users, carers, staff and members of the public, many of them members of this campaign. Congratulations to Great Yarmouth & Waveney CCG for making this recording available to the public, shamefully the only one of the seven CCGs commissioning services from NSFT to insist upon a public consultation. It should be noted that the low volume of the audience in the mix in no way reflects the reality in the hall that evening. Let us know what you think in the comments section below about what was claimed by the NSFT Acting Chief Executive (Andrew Hopkins), Operations Director (Kathy Chapman) and Medical Director (Hadrian Ball). 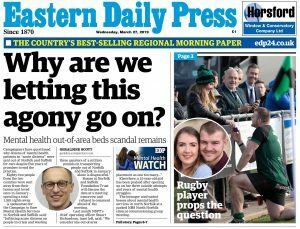 We distributed about 100 copies of an open letter written by NSFT nurses in Norwich caring for people from Great Yarmouth & Waveney which exposed this ‘consultation’ as a sham. Every NSFT and CCG director present was given a copy by hand and from their solemn faces they did not appear to find our exposure of the truth enjoyable reading. The EDP posted a copy of the open letter on its website. We held a demonstration before the meeting as well as asking demanding questions of the NSFT and CCG directors. Campaigners travelled from all over the NSFT area, from north Norfolk to south Suffolk. We filled the venue and held a well-attended campaign meeting afterwards which broadened our support in Suffolk and on the coast. 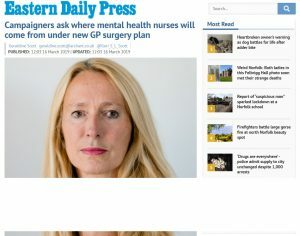 The Operations Director of NSFT continues to attempt to justify further savage cuts to the adult acute inpatient budget on the grounds that forty per cent of the budget is unfairly spent on only two per cent of service users as though this is an example of unfair and wasteful allocation of resources. If we say applied this fatuous ‘thinking’ to midwifery and obstetrics, the Norfolk & Norwich University Hospital would forthwith close its Neonatal Intensive Care Unit (NICU) as it would be considered that a disproportionate amount of money was spent on the neonates with the greatest need rather than the ones who popped out on time and promptly went home. Of course, those in greatest need will consume a disproportionate amount of resources and NSFT and its CCG commissioners have statutory obligations to those who may be a risk to themselves or others. Our initial consultation response is available here together with links to the official consultation documents.